Oxford Dictionaries announced this week that the 2015 Word of the Year is not a word at all but an emoji — more specifically the “face with tears of joy” emoji. The title recognizes the newfound status and influence of emojis in our everyday digital communication. Whether it’s a “heart,” a “fistbump” or a “slice of pizza,” emojis are found everywhere as a pithy and fun method of expression. So much so that people dressed up as emojis for Halloween and presidential candidate Hillary Clinton opted for emojis to communicate. In fact, 2015 saw an exponential rise in the word emoji, also known as an emoticon. The word has been around since the 1990s, but the usage more than tripled in 2015 alone. Though there are more than 1,000 emoji characters, Oxford University Press’ partnership with SwiftKey, a mobile technology company, revealed that was the most used globally in 2015. One-fifth of that usage was from the UK, and another 17 percent from the U.S. That’s a sharp rise from the 4 percent and 9 percent respectively in 2014. 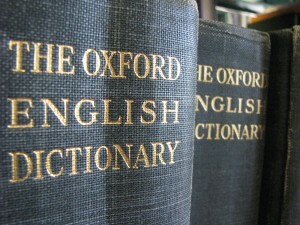 Oxford Dictionaries Word of the Year — which is chosen by a team of lexicographers and consultants to the dictionary team — is known as a reflection of cultural development and trends. Last year, the word was vape and the year before that was selfie. The word Brexit, which is defined as “a term for the potential or hypothetical departure of the United Kingdom from the European Union, British + exit” reflected the political atmosphere of 2015. Left: Photo by Flickr user emdot.